A couple of weeks ago I was at the 2nd annual Amsterdam Symposium on the History of Food, and a very interesting meeting it was too. The topic was Food, Hunger and Conflict, a reminder that food and control of the food supply can be both a weapon in human conflicts and a natural source of conflict. Talks ranged widely, from the politics of starvation under the Nazis to hunger in colonial Indonesia to the part food riots in the past played in winning food security. Some of it was – and I’m avoiding obvious wordplay – very hard to listen to. All of it was enlightening. There wasn’t as much time as I hoped during the packed but brief programme to record everything I wanted to, but I did get to talk to Ian Miller about force feeding and to Christianne Muusers about one Dutch wartime recipe that most people would rather forget. I hope to have some of the other speakers on the show soon. Ian Miller has a website called Digesting the Medical Past. 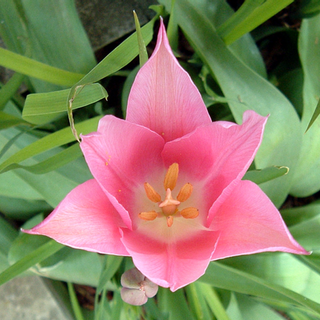 The tulip in the photo is China Pink, and I took it. The banner photo shows Thomas Ashe’s funeral.